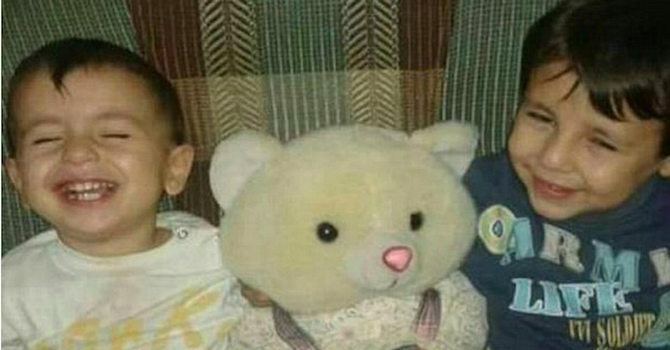 Featured image: Alan and Galip Kurdi via The BBC. At WITNESS we see hundreds of images of distressing events and we know that there are millions of images of horror out there in the world. It is a function of our ‘cameras everywhere’ world that there is a greater volume of images that show the dark side of life. Some are shot with the best of intentions by citizen eyewitnesses, others are shot by journalists and some are shot by perpetrators. We often grapple professionally with how we understand what images to share and how to share them. Sometimes a particular image breaks through and hits me particularly directly and personally. 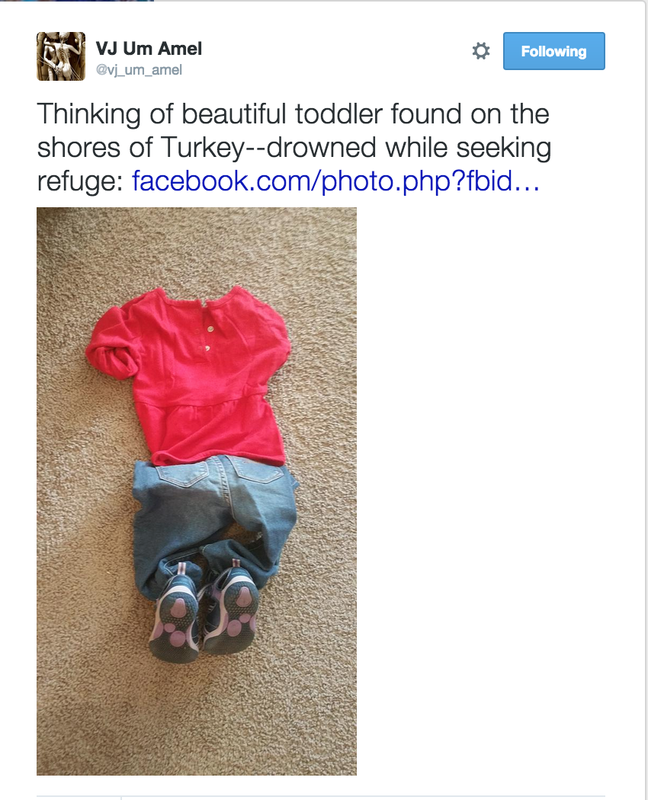 I cried when I saw the image of Alan Kurdi (initially identified as Aylan Kurdi), a young Syrian Kurdish boy dead on a Turkish beach, and it made me think through a very personal lens about the choices I and others make to view and to share images like this and the constraints upon those choices. Last year I wrote about this topic in a blog post on ‘Images of Horror: Whose Roles and What Responsibilities?‘ in which I explored the sharing of images of the killings of hostages by ISIS. I looked at our roles as sharers, for example how individuals shared the images – or counter images of the hostages with their families – via their social networks via our social media networks. And I discussed the roles that those platforms, on which we were sharing the images, played. The debate around this question has been reignited in the social media and professional media spheres in the US and globally around two recent but separate incidents. First, the distribution on social media of a video shot by a man of the moments in which he murdered a news reporter Alison Parker and her cameraman Adam Ward. The second, the photos shared of Alan Kurdi, who died at sea while trying to reach Europe with his family and whose body washed-up on a popular beach in Turkey. Much of the debate has focused on the role of the media in sharing these images (for a good survey see Robert Mackey’s post in the New York Times), but equally important is the question of our role as individuals and communities in watching, sharing and using them (and ultimately, most important will be the question of how our policies, laws and actions change in response to these images). All of these as equally apply to a murder on camera, as a war crime on camera. An additional technical aspect that has emerged is the way in which videos autoplay in social media platforms such as Facebook. So, like it or not, we can be scrolling through a social media feed, and be exposed to someone’s life being taken in front of our eyes. There are no technical fixes here if auto-play continues to become the norm, other than to make sure individuals can choose to switch it on or off. As with other contexts much of this relies on a rapidly-reacting content review team at the social media outlets that can either make choices about when content should be taken down or to ensure there is a graphic violence warning and that auto-play is disabled on that particular video. Many applauded Facebook and Twitter’s fast action to take down the killer’s accounts in the Virginia shooting case. However, the power vested in these companies is fraught with challenges. So far, we have not seen the images of Aylan Kurdi deleted or removed from Twitter or Facebook (though they come with a graphic content warning) but this may only be because of the attention given the image on both social media and in the mainstream media. “The photographs are elegiac, mournful and devastating. They were shared over 100,000 times, reaching me on August 30 via an Indian friend living in the U.K. I was moved to write a blog post “The Drowned and the Sacred” that has been read and shared thousands of times. His photos had been taken down by content review processes in Facebook, presumably for violations of guidelines on graphic imagery (though no information was apparently shared to Khaled Barakeh on the rationale). We also need the types of more conscious conversation about what we choose not to watch and not to share that have been taking place around these images. This discussion is one about human dignity. Of course, at WITNESS we believe in the right to free expression, but also the importance that human rights discourse places also on individual dignity and integrity and how we protect people who have suffered violence already from further re-victimization. But it is also a conversation about the power of these images to break through the chatter, incite discussion and mobilize change, and how we balance these imperatives. Just as in earlier examples of how people responded to ISIS images of killings, one element that we saw in both the cases of the murders in Virginia and Aylan Kurdi is the power of amplifying counter-speech and symbolic speech from each of us an individual sharing online. In terms of amplifying counter-speech, people shared images of the two young people killed in Virginia in happier times. 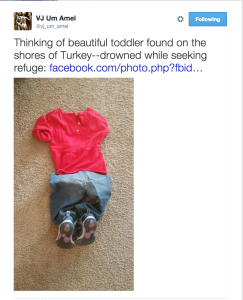 Similarly in the case of Alan Kurdi, individuals made a choice to amplify his story with images that expanded the reach of the original image. There are only so many times one can see a heart-breaking image of a toddler dead in the surf, but there are alternatives that amplify the reach of the moment. One of the most powerful I saw in my timeline was the choice of VJ Um Amel to share her own image of a toddler’s clothing arranged just as Alan lay in the sand. Other choices included sharing family photos of Aylan and his older brother (who also died) in a happier moment, and sharing images of one’s own children enjoying the beach in the way children should enjoy a beach. And cartoonists and remixers have taken the image and turned it into a range of poignant, beautiful and angry images that transmute Alan’s image to an idyllic beach with a bucket-and-spade, a peaceful night-time’s sleep, or the floor at the center of the UN Security Council Chamber (warning: graphic image) and multiply its reach and advocacy impact. When We Do Share the Image? But many of us – including myself – did share the image of Alan Kurdi dead in the surf (as did many European newspapers). This decision asks us at the personal and collective levels to balance out imperatives of individual dignity and re-victimization with a recognition of the iconic power of this image. Such a discussion is not new: we have seen how iconic images take an individual act of degradation or pain – such as Kim Phuc, who was photographed as a young girl napalmed in Vietnam in 1972 or Neda Agha-Solta, shot in Iran in 2009 – and turn it into a representation of a systemic problem. “I thought long and hard before I retweeted the photo. It shows a lifeless toddler, lying face down on a popular Turkish beach, one of eleven Syrians who have almost certainly died as they tried to reach safety in Europe by boarding a smuggler’s boat. Instead they ended up as the latest victims of Europe’s paltry response in the face of a growing crisis. Abdullah Kurdi collapsed in tears after emerging from a morgue in the city of Mugla near Bodrum, where the body of his three-year old son Aylan washed up on Wednesday. A photograph of the boy’s tiny body in a bright red t-shirt and shorts, face-down in the surf, appeared in newspapers around the world, prompting sympathy and outrage at the perceived inaction of developed nations in helping refugees. Aylan’s 5-year-old brother Galip and mother Rehan, 35, were among 12 people, including other children, who died after two boats capsized while trying to reach the Greek island of Kos. “The things that happened to us here, in the country where we took refuge to escape war in our homeland, we want the whole world to see this,” Abdullah told reporters. “We want the world’s attention on us, so that they can prevent the same from happening to others. Let this be the last,” he said. Sam Gregory is the Program Director at WITNESS. Sam also leads on the Technology Advocacy program and the Mobil-Eyes Us initiative. You can follow him on Twitter @SamGregory.